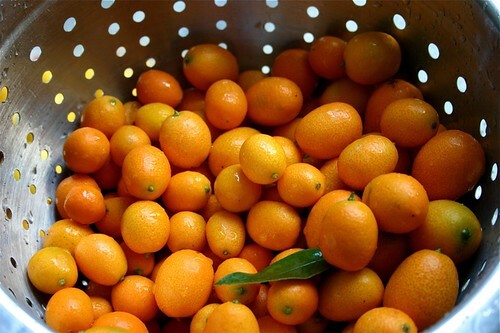 Escaping Portland's cold grey winter and traveling to Southern California recently I knew kumquats were in season. I've been known to begrudgingly and infrequently pay $6/pint for kumquats here in Portland. But buying local when in the locale of their growth? A San Diego County roadside stand offered them for $2/pint, and I snatched up 3 pints of the mini orbs of tartness, and stashed them in my suitcase for travel back to the land of cold. 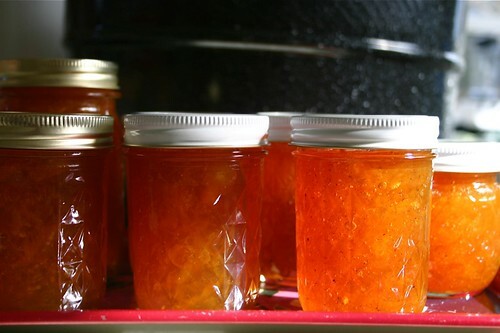 I knew I wanted to make marmalade: marmalade is a jam with bits of citrus peel in it, and since the sweet part of the kumquat is its peel, kumquat marmalade is puckery and sweet and sour all at the same time. Add some vanilla bean to the mix and you have a concoction of sinful wonder. 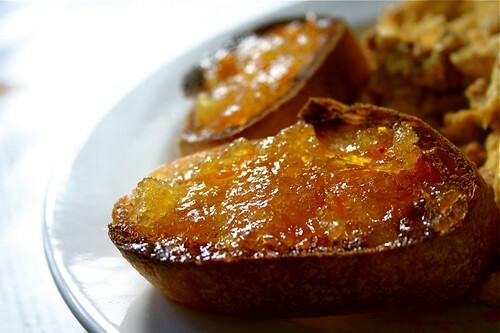 I researched different recipes and techniques both in books and online, and discovered that you don't have to use pectin in the making of this if you reserve the seeds and use them in the production of the jam since they naturally create pectin. That means the marmalade is just fruit and sugar. And speaking of sugar....in no way did I use anything close to the amount of sugar called for in most recipes. I just can't bring myself to pour that much processed sugar into the fruit. Plus, I prefer it tart. Pucker up! Wash and scrub your kumquats. Get comfortable and start slicing. You want thin slices, and remove and save the seeds as you go. It may take a while. With the reserved seeds, create a cheesecloth bag and add it, the sliced kumquats and water to a large pot. Bring to a quick boil and simmer 5 minutes. Remove from heat, cover, and let sit overnight. As the jam thickens, make sure you're stirring and not allowing it to stick to the bottom of the pan. Skim foam. You can test the jam for jelling point by putting a spoonful of the liquid onto a small plate, and setting in the freezer for a few minutes until it comes to room temperature. Turn the plate sideways to test if the liquid drips: if it's still runny at room temperature, keep cooking. If it gels and does not drip, it's done. Ladle into hot jars and process in a water bath for 10 minutes. Makes 5 jelly jars + 1 pint of marmalade. This is inspiring me for the season yet to come. It also reminds me of the orange peel candies that my grandfather use to make and gift to me each year. Hope you enjoyed your trip! Thank you so much for this wonderful recipe! I am originally from California and I miss the kumquats. I dream about that scent, that flavor! So many people had them in their yards and didn't eat them, they just fell to the ground never to be tasted! The horror! I will be making this if I can get my hands on some kumquats!!!! You need to go into business and sell this stuff Lelo. I just nominated you for the Kreativ Blogger award. I love to read your blog! Hey, Lelo, where in S. Cal did you grow up? I'm from Covina. I love loquats! My mom has a tree. I cannot even begin to imagine how tasty this must be! What a great use for kumquats. Your description of "the scent of citrus blossoms and cut grass mixed with lemon" just transported me. That sounds so blissfully happy! I'm jealous of the kumquat marmalade. I was just mentioning to a friend yesterday that it would be fun to make some with those little clementine oranges when they flood the grocery stores in December. I'd love to know if you would be wiling to share your label template! love it! Hey Northwest Mom: it's not a template! The labels I use for our canned goods I designed myself. Fancy, huh?! This looks delicious - thank you for posting the recipe! 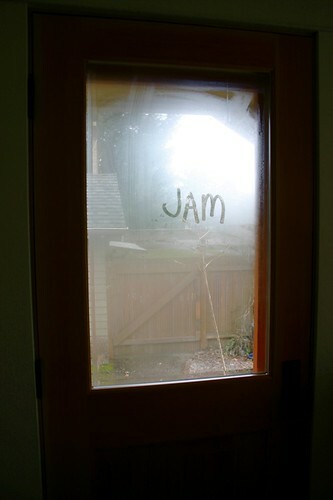 I started making kumquat marmalade years ago when I lived in Eugene. 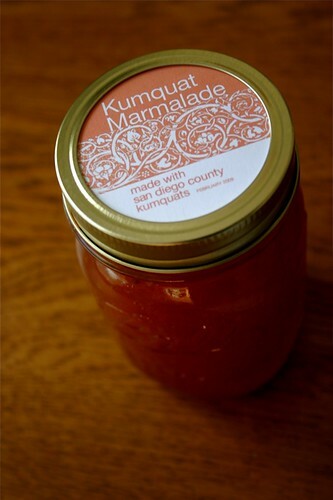 Now I live in the southern Rockies, but I still make kumquat marmalade. I like the idea of adding a vanilla bean; sort of a marmalade/fruit butter cross pollination. Kumquat trees are easy to grow in containers, and when grafted onto dwarf rootstock they stay about 4 feet tall or less. I got two at a local greenhouse about 15 years ago, and every year I harvest enough kumquats to make marmalade for me, my family & friends. I keep the trees inside during the winter and outside in the summer, so I don't have to hand-pollinate the flowers. Fourwinds growers sells dwarf kumquat trees online too. I like the Nagami variety, because it's easy to peel and a little bitter. Meiwa is nice, but sweeter and not as intense a flavor. Fourwinds also has Seville orange trees. I got two from them a couple of years ago. The Seville orange trees are kind of young yet, but I've gotten fruit off of them already. They're blooming now (mid-March) indoors, so I hand-pollinate the flowers with a Q-tip. The fruit won't be ripe until early next year, but they are full sized and make great marmalade. Where do you buy the marmalade jars? I have a kumquat tree and I eat the fruit off the tree. I was wondering how to make jelly or jam out of it. Your recipe looks and tastes great! I'll try it. I live in the Central Valley. Just made the marmalade as directed and it is DELICIOUS! Hmmmm. Maybe I boiled too long. Oh well! It was delicious - thanks for sharing. I will never look at my mom's mini kumquat tree the same way again! I'll be making this today: may substitute star anise for the vanilla bean, however, because mine are a bit dried out. Thanks for the inspiration! I just happen to have 3 pints of kumquats (from Walmart of all places: produce options are limited here in south central Kentucky, especially in winter) and my husband's birthday was yesterday (and he loves marmalade). Thank you! I'll be back to read more of your blog. I like it already.